Last year's Young Farmers steer winners Garry Stanger, right, and Beth Alexander. The deadline is fast approaching to enter this year’s Premier Meat Exhibition. The annual prime beef cattle and lambs contest, organised by the Scottish National Fatstock Club (SNFSC) in conjunction with meat processor Scotbeef, takes place over two days in the middle of November. Sponsored by Marks & Spencer, the exhibition starts on Wednesday, November 14, with live judging at Caledonian Marts’ Stirling mart, followed by judging of the carcases and presentation of prizes at Scotbeef’s Bridge of Allan meat plant on Saturday, November 17. Well-known stockman Alistair Cormack, of Stuartslaw Farm at Allanton, near Duns, will judge the live cattle, while leading sheep producer Andrew Baillie, of Carstairs Mains Farm, Lanark, will judge the live lambs. 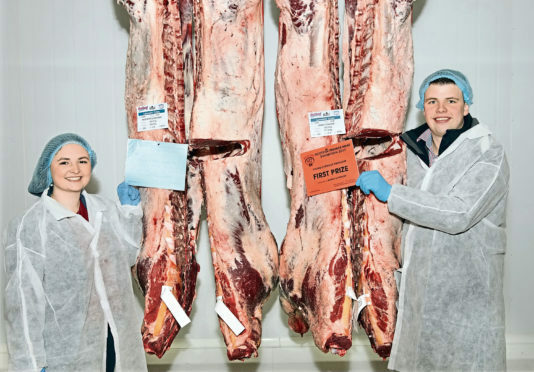 Beef carcases will be judged by beef farmer and former meatwholesaler, Neil Stoddart of Halflawkiln, Tynehead, Pathhead, Midlothian, and the lamb carcases will be judged by Woodhead Bros of Turriff procurement officer Richard Henderson. SNFSC chairman John Bannatyne of Drumalban Farm, Lanark, said a feature of the event was the young livestock producer classes, which are open to exhibitors aged between 16 and 26. “We are keen to attract even more entries and would encourage all young farmers to take part to help develop their skills in livestock production and understanding the requirements of the market,” he added. The deadline for entries is Friday, October 12. Entry forms can be downloaded from the club’s website, www.fatstockclub.co.uk, and should be sent to secretary Margaret Gray, who can be contacted on 07939 523575 and secretary@fatstockclub.co.uk.